Then Pharaoh sent and called Joseph and they rushed him out of the dungeon; he shaved himself and changed his clothes and came to Pharaoh. (Bereishit 41:14). the balmy breeze flits lightly on his face. he is ushered in to stand before the king. the Grand Vizier of the land of Egypt. The Sforno says that the word “vayeritsuhu” – and they rushed him, tells us that Divine salvation always comes hastily, speedily. In his book, Biblical Literacy: The Most Important People, Events, and Ideas of the Hebrew Bible, Rabbi Joseph Telushkin says that in Midrashic parlance there is an expression which has provided solace to suffering Jews for thousands of years: “Salvation can come in the twinkling of an eye.” Nowhere is this more evident than in Joseph’s story: he goes to bed one night as he has done for the last two years, as a falsely accused prisoner in an Egyptian dungeon, and the next night he goes to sleep as the Grand Vizier of Egypt. *Rabbi Israel Meir HaCohen Kagan (1838-1933) is commonly known as the “Chafetz Chaim,” the name of his famous work on guarding one’s tongue. As his reputation grew, students from all over Europe flocked to him and by 1869 his house became known as the Radin Yeshiva. The Chafetz Chaim published twenty one books. His first work, Sefer Chafetz Chaim (1873), is the first attempt to organize and clarify the laws regarding Lashon Hara. Other notable works include the Sefer Shmirat HaLashon, an ethical work on the importance of guarding one’s tongue and the Mishnah Berurah (1894-1907) which is a commentary on the Orach Chayim; the first section of the Shulchan Aruch and has been accepted universally among Ashkenazi Jews as an authoritative source of Halacha. in these dark winter days. *a translation and interpretation of the Sefat Emet’s Torah commentary. on the bright-hued pristine cloth. regales them with his dreams of fame. they spot the colors from afar. “Why not kill the loathsome dreamer? he sees the fury in their eyes. ignore his cries, sit down to eat. and bring it back to show their father. They look their father in the eye. on the bright-hued blood-stained cloth. The story of Joseph’s colored coat is one of the best known of Bible stories and of course a rich source for commentary. Chazal said, “See the consequences of favoring one child over another. Because of these few ounces of wool, our people were enslaved in Egypt.” (BT Shab 10b). The Etz Hayim commentary of the JPS points out the difficulty children experience in avoiding repetition of the mistakes their parents make, even though they are well aware of the problem at an intellectual level. The jealousy and frustration the brothers had kept pent up (the subsequent verse describes how the brothers hated Joseph so much that they could not say a friendly word to him) led to a horrifying level of increasing callousness, cruelty and intent to murder. No mention is made of Jacob trying to bring peace between his sons, even though Jacob berates Joseph for the dream in which the sun, moon and stars bow down to him. The text says merely that the brothers were jealous and Jacob bore the matter (of the dream) in mind. But it is assumed that the extent of brothers’ hostility was not apparent or Jacob would not have sent Joseph to them. to decipher what’s depicted there. Joseph never learns the signs. from his brothers’ jealous eyes. The question is asked why Joseph regaled his brothers with his dreams of glory, which only served to inflame their jealousy. Sforno* comments that he was too young and naïve to anticipate their reaction. Rabbi Samson Raphael Hirsch sees Joseph as a lonely boy who missed out on the influence of a mother. Rashi comments on the phrase, “Now Israel loved Joseph best of all his sons for he was a child of his old age…” that it means that Joseph was a wise son. In her book, Genesis: The Beginning of Desire, Dr Avivah Zornberg posits that Joseph is “a child prodigy, prematurely knowledgeable, devastatingly unaware.” She points out that he behaves with “the narcissism of youth, with a dangerous unawareness of the inner worlds of others.” Dr Zornberg notes his growing wisdom as he becomes sensitive to people’s faces and their expressions. Years later, the adversity that he has endured has matured him to the point where, encountering Pharaoh’s imprisoned butler and baker after they have had their disturbing dreams, he asks them why they look so troubled. *Rabbi Obadiah ben Jacob Sforno was an Italian rabbi, philosopher and physician. He was born at Cesena about 1475 and died at Bologna in1550. He was a prolific writer, chiefly in the field of Biblical exegesis. His commentary is notable for his respect for the literal meaning of the text and his reluctance to entertain mystical interpretations. the moment of reckoning has come and I’m ready. a kaleidoscope of images floods through my mind. I fight as though battling for my father’s regard. I trailed behind Esau in each physical fray. tough sinews, strong bones – now we’re well-matched. buying his birthright, taking his due. I loosen my grip and he almost prevails. God’s promise sustains me – I tighten my hold. he knows where I’ve been and whom I’ve become. He has called me by name – and we are both one. Who was this mysterious antagonist who wrestled with Jacob? Commentators, both ancient and modern, have pondered this question. The text introduces him as a man; the Midrash and earlier commentaries elevate to him to the status of angel; while Jacob himself says, “…I have seen God face to face…”(Bereishit 32:31). The early commentators almost unanimously describe the enigmatic being as a malevolent messenger, Esau’s guardian angel, sent to weaken Jacob prior to the pending confrontation. Nechama Leibowitz suggests that before Jacob encountered Esau in the flesh, his spirit struggled with that of Esau. In his book Covenants and Conversation: Genesis, Rabbi Jonathan Sacks describes Jacob’s long-standing desire to be in Esau’s place: struggling with him in the womb, Jacob is born clutching Esau’s heel; he buys his birthright; dresses in his clothes and impersonates him; takes his blessing and answers his blind father’s question by claiming to be Esau. “Esau is everything Jacob is not. He is the first-born…He is strong, full of energy, a skilled hunter… [and] he has his father’s love.” Rabbi Sacks describes the wrestling match as Jacob’s inner battle with existential truth, a battle to uncover his true identity – whether he was the man who longed to be Esau or the man whose destiny lay in transmitting the covenant of Abraham. The Etz Hayim commentary of the JPS posits that Jacob might have been wrestling with his own conscience, torn between his very human desire to run away and the divine impulse impelling him to stay and make amends with Esau. This position may find support in the text, “you have striven with God and with men.”(Bereishit 32:29) By remaining, Jacob sheds his identity as a deceiver and takes on the character of Israel who wrestles with God and people instead of avoiding or manipulating them. Although he is wounded physically after the struggle, he is described as shalem, meaning “safe” or “whole”(Bereishit 33:18). The Sefat Emet understands this to mean he has acquired an integrity he didn’t have before. Rashi interprets the word “wrestled” vaye’avek as derived from an Aramaic word for intertwined. He envisages each protagonist clasping the other in an attempt to overthrow him. These are rivals who are also connected – hence the sages’ view that the mysterious adversary is Esau’s guardian angel. Rashi also notes the etymological connection with avak, meaning dust, referring to the dust raised by their feet as they struggled. The Sefat Emet expands the theme, commenting that the dust raised in the fight rose as high as the throne of glory. He adds that the power of the struggle with the “other side” reaches that high. The relationship between two sisters, bound by familial ties, but competing for the love of the same man must have been fraught with tension. (After the Torah was given on Mt. Sinai, the marrying of two sisters was forbidden.) Yet the Midrash says that although Jacob and Rachel had devised a code to prevent the deceitful Laban from substituting Leah for Rachel on their wedding night, Rachel compassionately disclosed it to Leah to spare her sister from shame. 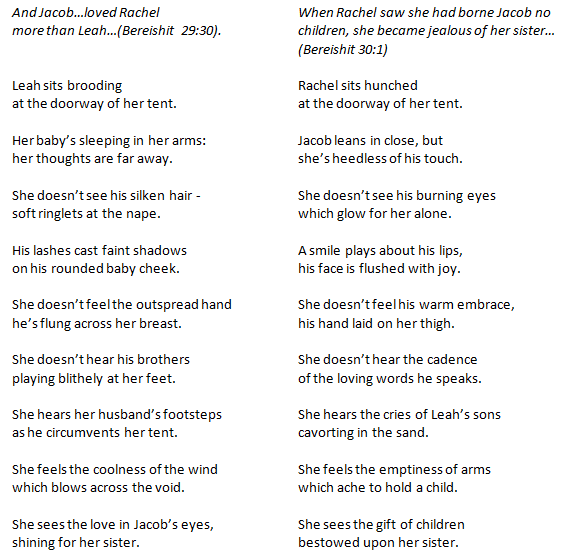 The Midrash also suggests that Rachel was jealous of Leah’s righteousness, assuming that the gift of children was because Leah was more righteous than she, as opposed to being envious of the children per se. The Midrash also tells of all the wives of Jacob: Leah, Rachel, Zilpah and Bilhah uniting their prayers with those of Jacob, to remove the curse of barrenness from Rachel. And in a Midrash on Lamentations (Eicha Rabba 24) Rachel challenges God over the destruction of the Temples, saying that just as she (mere flesh and blood) overcame her jealousy of Leah and was compassionate to her, saving her from shame, and enabling her to marry Jacob before she did, so an all-merciful God should be able to overcome His jealousy of inanimate foreign idols, because of which He destroyed the Temples and left His people to the mercy of their enemies! And God replies that in her merit He will restore His people to their place!